It's a tough job to carry your love symbols with care and delicacy up to that long aisle. Our assortment of ring bearer pillows is designed to create that tedious job a little cooler and even prettier. 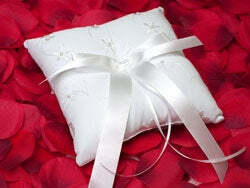 Our range of ring pillows takes account of those styles that are perfect for any wedding.